Okay, so I know this is late. We’re almost halfway through September (what?!) and this is adapted from the August issue of Bon Appetit. I’m going to go ahead and blame the earthquake and the hurricane that happened over the course of a single week here in NYC (again, what?!). Now is probably better timing for this recipe anyway—and trust me, you’re going to want to make it now. 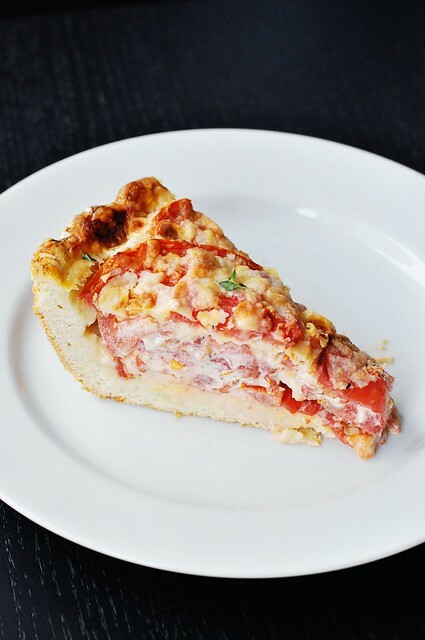 Check it out: tomato cheddar pie. Half of you just went yum, and the other half of you were like, huh? Yeah, I heard you. 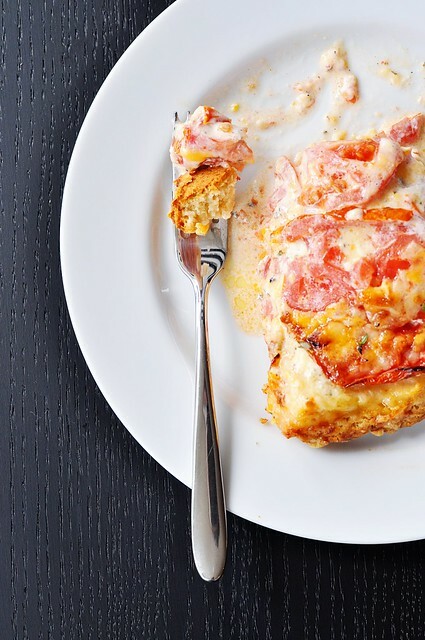 Picture this: a thick, savory buttermilk biscuit crust filled with layers of sliced summer-sweet tomatoes and melted shreds of sharp cheddar cheese, all slathered between with an herbed mayo. 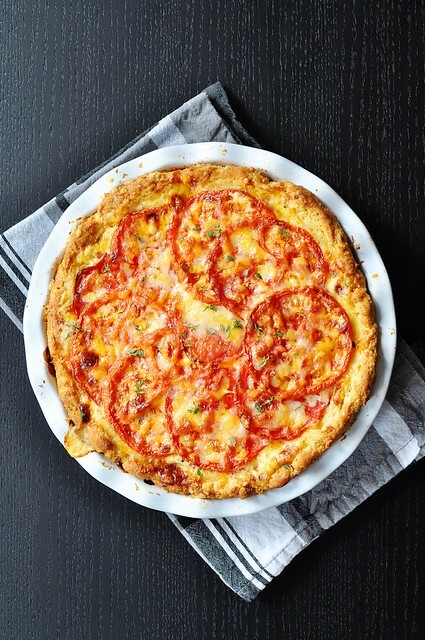 I swapped the dill in the original recipe for a bit of fresh oregano and thyme, making this version taste like a crazy-awesome cousin of the deep-dish pizza. And now is the perfect time to throw one together. Don’t tell me you haven’t felt it—the air is beginning to change. We’re all trying to hang onto the last bits of summer, and I think we can agree that the tomato is a major part of that. But as much as I’m not ready to see the sweet corn, zucchini, and that mottled palette of heirlooms disappear from the market, I have to admit that I’m really starting to crave those autumn flavors. I’m excited about big pots of chili, hearty soups, creamy baked pasta dishes, and tender braised meats. So this pie is perfect for right now, for this time in between. It’s transition food. And I can’t think of anything better to usher us into fall than the last tomatoes of summer blanketed in cheese and baked into submission. Can you? The only downside to this pie is that it needs to rest for a few hours after baking to really set up–the longer the better, really. If you cut into it too soon, it will ooze and drip everywhere. Not that that’s entirely a bad thing. You do have that thick, biscuity crust for sopping after all. In a medium bowl, whisk together the millet, brown rice and tapioca flours, the potato starch, xanthan gum, baking powder, baking soda, and salt. Add the butter to the flours and use your fingers to gently rub it in, until the mixture resembles a coarse meal strewn with a few larger chunks. Stir in the buttermilk. Use your hands to knead the dough in the bowl; it will be extremely sticky. Knead until all the flour is incorporated and the dough can be lifted from the bowl in one piece without sticking very much (it will still be very sticky in your fingers). Wrap the dough in a piece of plastic wrap, forming it into a disk, and refrigerate for one hour. Place the dough between two pieces of plastic wrap and roll until it is about 1/2″ thick and will fit inside a 9″ pie plate. Once rolled, remove the top layer of plastic wrap and carefully invert the dough over the pie plate, trying to center it as much as possible. Gently drop the crust into the dish and remove the second layer of plastic wrap. Line a baking sheet with a double layer of paper towels, spread the tomato slices over them, and cover with another double layer of paper towels. Allow to drain for 30 minutes. In a medium bowl, combine the cheeses until evenly distributed. Remove about 1/4 cup of the cheese mixture and set aside. In a small bowl, whisk together the mayonnaise, thyme, oregano, vinegar, sugar, salt, and pepper. Sprinkle the bottom of the crust with the cornmeal and scatter in a layer of cheese, about 1/2 cup. Layer 1/3 of the tomato slices on top of the cheese, overlapping as necessary. Spread the tomatoes with half of the herbed mayo. Next, add 1 cup of the cheese and top with half of the remaining tomatoes. Spread the rest of the mayonnaise over the top of the tomatoes and add the last cup of cheese. Layer on the final tomato slices, topping with the reserved 1/4 cup of the cheese mixture. Fold overhanging crust, if any, over the top of the pie. Place the pie in the oven and bake for about 40 minutes, until the crust is deeply golden and the cheese is melted and browned. Allow to rest for 1-3 hours before serving. P.S. Make sure to also try the eggplant fries from this issue–they’re already gluten-free as written! I strayed from the Middle Eastern seasonings when making them and went in an Italian direction instead, serving them with marinara for dipping. One word: amazing. Oh wow, that looks amazing! 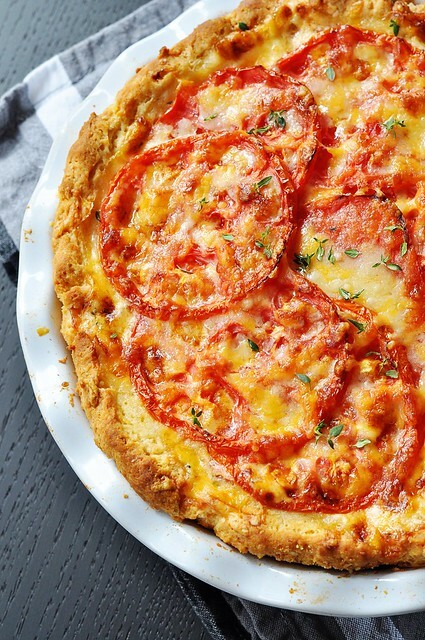 I’m definitly going to make that when I can find enough fresh tomatoes! So yum! Could I just leave out the mayo? My husband won’t eat mayo or Miracle Whip. It looks wonderful but I can’t make it just for myself! OMG! My mouth is watering just looking at it. Barb, you could try leaving out the mayo and just sprinkle herbs in between the layers, or I’ll bet sour cream (if your hubby will go for it) would be a good substitute. If you try sour cream, you can probably leave out the vinegar and sugar too since it already had a good tang on its own. Update: Since my mind never stops going, I’ve come up with a couple more subs. If you’re the kind of people that like to put ranch dressing on everything, you could try that. Also, if you wanted to make it even more pizza-like, you could use marinara sauce or ricotta cheese. Oh the possibilities! This looks soooo good! I love all the main ingredients. Will definitely give this a try asap. I made this and it was yummy! The whole family loved it. I used half mayo and half plain yogurt and it was great.